Fans of the New York Times Bestselling book series, Percy Jackson and The Olympians get the adaptation they deserve! In 2010, the Percy Jackson books were adapted into two movies: The Lightning Thief and the 2013 sequel, The Sea of Monsters. Fans were devastated at the movie adaptations, so hearing that a musical was being made for the beloved series left them skeptical. But that certainly wasn’t the case. The musical went on to bring the first novel to life in a way the fans never expected, in an accurate way. Accuracy is what makes the musical so well liked by the fans. Now, the entire novel can’t be fit in a two-hour musical, but it did not feel condensed or rushed in any way. Certain scenes were cut in the show, which just so happened to be scenes in the movie that were butchered. The Lotus Casino Hotel scene was poorly done in the film, was briefly mentioned in the show and quickly moved on to something else. The cast also does an amazing job of pulling double duty, it is a small cast, so some of the actors played multiple roles. The band was small as well, keeping it simple with guitars, bass, keys and drums. The music falls under the rock genre which keeps the show fun, upbeat for everybody. The audience of the show ranged from young kids, young adults. The youngest of fans traveled with their families from as far as Detroit just to catch it here in Toronto. The Percy Jackson series left as big as a mark on young readers as the Harry Potter and The Hunger Games series. Though not as successful as Harry Potter and due to the poorly done movie adaptations, the fan base disappeared, but if you’re talking about the novels, then the fans will surely appear again to talk about it. Even if you don’t know anything about the series, listen to the soundtrack, watch the show, and forget the movies. The Lightning Thief is the adaptation fans truly deserved, perhaps we’re all still waiting to be claimed be our Godly parent. 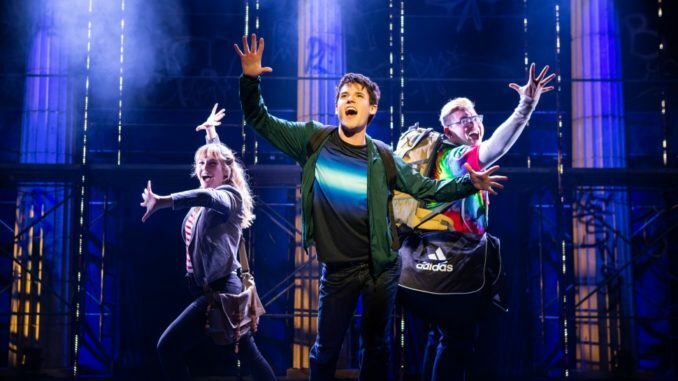 The Lightning Thief was only at the Ed Mirvish Theatre for a limited engagement this past week, but you can catch it on tour, next stop is New York City at the Beacon Theatre. And for those who don’t know a lot about the series or the first novel, here is a quick synopsis. “The gods are real…like the Greek gods are real” and young Percy Jackson’s world gets flipped upside down. Take a journey to Camp Halfblood, a haven for all demigods (half mortal, half god). Only to get kicked out after being accused of stealing Zeus’s lightning bolt. Get sent on a quest across America to find the missing bolt with you new best friends: a satyr and a daughter of Athena. Fight a bunch of monsters, meet a bunch of Gods, save your mother and finally meet your godly parent.